Reflecting on the WMSC decisions on regulation changes for 2009 and beyond, I have to admit that good sense seems to have won over the FIA at last. None of the new rules for the coming season appear to threaten the ethos of F1 and the wilder proposals from Mosley and Ecclestone have been shelved for the time being. It is as much as we could have hoped for. The teams seem certain that considerable cost savings will result from the new rules and, since they are the ones footing the bill, that is good enough for me. Whether the economies will be as effective as predicted remains to be seen but I think the issue will fade in importance as the year goes on; much of the panic over the downturn has been manufactured for the purposes of the US election and reality will break through now that politics has had its way. It is a pity that the most pressing problem confronting the sport was not on the agenda, however. The matter of customer cars still hangs over the future of teams like Scuderia Toro Rosso and affects the potential for new entrants to F1. Unless the problems involved in this issue are solved soon, the likelihood is that the number of participants will continue to shrink. It is a very difficult matter, arguments on both sides being deeply rooted in the vested interests of each team, and compromise will be needed on both sides before a solution can be found. To me, that would indicate that the FIA and FOTA should be discussing the possibilities now, rather than avoiding the issue, as they seem to be doing at the moment. The more time available to thrash out a deal satisfactory to all, the better. The proposals for 2010 and further into the future do not concern me too much; the coming season will show just how much change is still necessary and we may never see some of the suggestions come into force. It is all far enough away to be put on the shelf with Bernie's medals and Max's standard engine anyway. KERS remains an oddity amongst the many changes forthcoming and I do not understand why the teams are not making a fuss about having to spend money on its development when it looks as though it might end up as a standard component. I can only suppose that, without any firm decision being made on this, the teams are accepting the interim expenditure as a necessary evil. Looking ahead to the coming season, it seems that the races will be as exciting as ever, with the possibility that the severe limitations on aerodynamics might increase the possibilities for overtaking. A lot has been said about the look of the new generation of cars for the change in technical regulations, most considering that they are ugly, but I think this feeling will dissipate within the first few races. We become accustomed to the appearance of F1 cars and so any change is bound to seem strange at first - but give us time and we adjust to the new look. Hopefully, competition will be even closer than in previous years (and we've had some good ones lately) and we can expect a great season. For the moment, I am just relieved that the FIA has not done its usual hatchet job on the rules when presented with the need for change. FOTA seems to have had its way on most things and common sense has been the guiding light for once. Whether this is due to clever manipulation by Max Mosley to achieve what he really wanted all along or is a reflection of his need to rehabilitate himself after the scandal of this year is a matter of opinion. No doubt he will claim the credit but the important thing is that the sport has survived and we can keep watching. That has to be good, surely. I think the aero limitations for next year have been massively over-sold. The aim was to cut downforce by 50% from 2008 but Tony Purnell has already said that he expects the 2009 cars to have 80% of the 2008 level because the tea,s recovered more downforce than anticipated. Given that every time th FIA introduces a rule to restrict performance the teams exceed their expectations considerably you would have thought by now they could have built hat into their calculations. I don't expect the new aero regs to make any significant difference next year. You may be right, Steven, but getting rid of the winglets and fins is a step in the right direction, at least. The cars may be as fast next year as they were this season but part of that will come from the slicks - and that is what we want, more mechanical grip, less downforce. I regard the 2009 regulations as the beginning of a series of changes to limit the amount of downforce the engineers can get from aerodynamics so that, ultimately, it will be back where it should be - a part of the whole package but not the most important factor in a car's performance. We can all breath a collective sigh of relief that the changes agreed to are the more sensible of those proposed. Next year's racing does look encouraging. I am loath to admit that Clive is also right about the cars looks. It will probably only take a few races to get accustomed to the new configuration, but (phew! ), as of now, they look like they could turn a man to stone. I currently find platitudes are the best reaction: beauty is only skin deep, and its what's inside that matters. Or "...The Ferrari/McLaren/BMW... team has such a great personality. I'm sure we'll still like 'em." I suppose these are the kinds of things we like to worry about, rather than the spectre of spec. engines. The combination of reduced aero and increased mechanical grip could lead to more of the drifting and sliding that we got to see this year. Car control is a dance of finesse that has been largely hidden by the vail of aero grip. I would love to see some beautiful four wheel drifts on the entrance and exits of slower corners. If Canada were still on the roster, the wall of champions might look a little less like a game of chicken and more like cars being driven on the edge of performance (and on the edge of sanity). We definitely have things to look forward to. I can't wait for March. Hear, hear, Marc - roll on, next season! Yeah, it seems the changes for '09 are mostly good ideas. Should make the racing more exciting...while reducing costs. It's just too bad that some of the costs savings won't be directed at reducing ticket prices (especially Monaco) and perhaps the fees promoters are forced to pay. That's something that really needs to be addressed before all that's left are Asian and Middle Eastern races with empty stands. Do I see a Toyota having a spin in the photo there? A part of me secretly knew that cooler heads would come to more sensible regs, though I think that all came to pass in completely the wrong way. There's still plenty to complain about in the new regs because now most of the engineering advances are going to be totally invisible to the viewer, but at least it feels like F1 want to be a motorsport that will make sense in the long-term future. Can I hope that we're at least headed towards a new and reformed Concorde Agreement? I think the basic aero rules for next year are a step in the right direction albeit there have been some stupid mistakes made. What is the point in trying to design rules that promote closer racing and then sticking full with front wings which are far more likely to be damaged in close racing. There is no need for the rear wing to be so badly out of proportion. Anyone drawing up the regulations must have produced generic sketches of the cars and noticed that they were ugly. While the basic aero is good I am totally against the adjustable aero. It is perfectly possible to design a set of regs that allow racing so you have to wonder why anyone thinks adjustable aero is needed. This is simply an admission that they don't expect their basic aero rules to work. KERS is not needed in F1. When McLaren came up with it a decade ago it was as a performance differentiator in the grand tradition of F1. Something entirely from left field like ground effect aerodynamics, active ride or semi-automatic gearboxes. 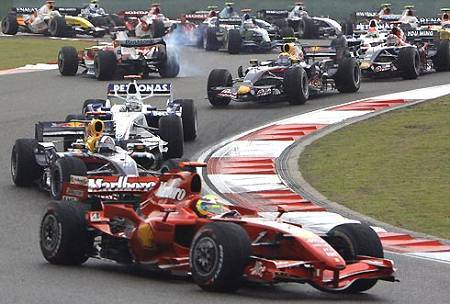 However cumpulsory KERS with limited performance has no place in F1 and I refuse to discuss push to pass buttons in F1. As Nigel Roebuck always notes. What would Gilles think? * Pretty close to demanding Max and Bernie to retire. Steven, you have expressed my thoughts exactly regarding the look of the rear wing. It would seem they could have given it the new height, lengthened the span and reduced the cord. There was a great article in Race Car Engineering about the extensive aero testing they did regarding disturbed air both following in line and following off line. There must have been some reason for it needing to be so narrow. They were quite thorough. Adjustable aero does seem strange given all the other aero reductions. I am a little saddened that we won't see such additions as winglets, flickups, and chimneys. They were changes we could expect to see from race to race, but I think the changes we do see this coming season will be more substantive and less finicky. I agree in part about KERS, and push to pass does seem absurd. They should just open it up. But the real issue for me is that there doesn't seem to be any avenue left completely open for the engineers to make advances. Still I have hopes for next season. I think they will surprise us. Chunter: Yes, it's a Toyota - the Shanghai GP. I am not too worried about engineering advances being made in areas invisible to the fans - at least we would have innovation again. And I'm not so sure that the sport needs another Concorde Agreement. Things are happening now that it's a straight fight between FOTA and the FIA without any previous agreement (made in circumstances sometimes completely different from what has developed) to complicate matters. Consider how the Concorde Agreement actually caused the confusion over customer cars - it seemed to outlaw them whereas FIA regulations allowed them. It is a bad idea to have two sets of regulations and the current situation of matters being thrashed out between the interested parties produces quicker results that everyone understands. Let the agreement go the same way as its airliner namesake, say I.
Steven: Gilles would be disgusted and go off to race snow mobiles! Marc: I think that, as the focus shifts from aerodynamics towards mechanical grip, the engineers will find new ideas occurring to them and we might see more innovation than expected. It will take time, of course - aero has held sway for so long that designers have become trapped in the thinking that the only performance tweaks worth trying are in that area. We live in exciting times! How to make Aerodynamic Millionaires! The win tunnels are now rationed therefore the schools which are one and the same will have fewer "graduates." Those who have done apprenticeships, learned the trade well and are quick with results will be the new stars of F1. They will be worth their weight in gold! Rules that curb the use of little wings or barn-boards only serve to make the time alloted to the wind tunnels so much more valuable so both the tunnels and the aero experts become part of a supply and demand situation. Since the real problem (as I see it): Transparency and the rigging of results has not been touched, just brushed under the carpet with the "news" we are probably in for the same old same old. Ecclestone and Mosley are not going to get better at their jobs. They are going to become worse and more senile than they already are. I think the best thing that could possibly happen to F1 would be for Mrs. Ecclestone to Divorce the old coot and run to the arms of Paul Stoddard (sp) with all the cash! Some see these new rules as a step forward but aren't they in effect more stringent still? They are still complicating things instead of simplifying them. If they want F1 to be the pinnacle of hi-tech, cut the engine displacement or the size of the engine cavity. If a team is allowed 20 engines and for whatever reason goes through them with four races left, I suppose they will not be able to race??? Good point about transparency, too, although I hope the changes to the stewarding regulations will address some of this. We will see. And I don't think anyone has mentioned what happens if a team runs out of allowable engines before the end of a season. Very, very interesting! I agree the Concorde Agreement in and of itself was pretty bad; I think I see your point, that although I would rather see some sense of consistent rule of law in F1 (that is, a document that clearly says "this" about "subject",) if these are to be times of change and innovation, perhaps some fluidity is in order. It would have been fine having the Concorde Agreement and the FIA regulations alongside one another if the FIA had remembered why that was the case. The Concorde Agreement is supposed to be the framework within which all else takes place. The document providing the fundamental long-term requirements of the championship, above and beyond the whims of one or a few individuals. It is the sporting equivalent of a constitution. The FIA regulations, on the other hand, supply the shorter-term, more precise regulations, including coverage of things that cannot sensibly stay the same forever. It's designed to be a lot more flexible. It is the sporting equivalent of a country's day-to-day laws. When Max Mosley assumed he could unilaterally override the Concorde Agreement to satisfy his whims, that was when the system fell over. It was revealed that the Court of Arbitration in Lausanne was too slow to deal with matters in the fast-paced F1 and that there was therefore no effective protection for the Agreement. Max was therefore able to ignore whatever parts of the Concorde Agreement he wished if he wanted that crumb of power. It is why he ignores the fact that the 1998 edition of Concorde holds that in the event of a lack of agreement over what should be done after it expires, it continues until such agreement is made. Nobody has formally disbanded the Concorde Agreement, nor has anyone agreed what the new Agreement should look like. Therefore it still holds, and apart from the FIA, everyone is acting like it is still in place. The Concorde Agreement didn't cause the confusion over customer cars. The FIA's refusal to pay attention to what the Agreement said caused that problem. If it wanted customer cars, it should have followed the established procedures for changing the contract - something that would have been a lot easier if it had not been so intransigent on other matters the teams thought needed to occur with regard to the Agreement. I'm assuming that a team which runs out of engines will get the same penalty as a team that breaks the engine rules now, i.e. a ten-place grid drop (on top of any other engine rules they may have broken in the process - there is either a three-race or four-race engine rule in effect, depending on how you interpret the press release). Still, it's not ideal not saying what the penalty will be. Whilst I agree with what you say, Alianora, the effect of having two legal documents governing F1 is to allow confusion to creep in, regardless of which side has manipulated the situation to its advantage. What was always needed in the case of customer cars was a clear ruling, for or against, that everyone could understand. As things stand, the matter has rumbled on behind the scenes and little progress has been made towards a solution. Had a definite decision been made, STR would know exactly where it stands and Mateschitz would be able to decide whether to keep the team together or dismantle it. Of course, if customer cars were allowed, a sale would be much more likely and we could expect STR to survive beyond 2009. As things, stand, I can see no future for it at all. If Max had taken the Concorde Agreement into account, there would have been a clear ruling - against customer cars. The Concorde Agreement specifically bans them. It was only because of his manipulation that the false impression that there could be customer cars on an FIA whim ever emerged. Even then, the FIA made a total hash of writing the regulations in a self-contradictory manner, which opened it to additional confusion and the eventual climbdown. Had there been only one document governing F1, the FIA would probably have ignored that too. The true flaw is with the FIA rather than the paperwork it was supposed to work with in this instance. If the Toro Rosso case had been dealt with correctly in the first place, it would still be constructing its cars using its Faenza base. It is in a factory that could easily have been upgraded to the standards of top teams (let's face it, Minardis nearly kept up with Jordans at the end of 2005) and it is only through neglect that this is no longer a realistic option for the Red Bull empire. With a factory building cars and constructor status (with only perhaps the initial design outsourced to Red Bull), none of this customer car stuff would have been a problem to it.